The Family Panel Reviews : Special Feature Alternative Easter Specials! 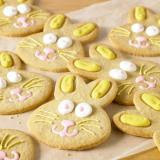 Special Feature Alternative Easter Specials! First up, the good old fashioned sweet tooth satisfying chocolate! But in this case, Greggs have used their bakers imagination to come up with a range of alternatives to the classic Easter Egg. 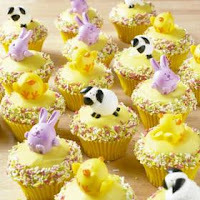 We had great fun trying out everything from Fairy Cakes with icing and sheep and bunny rings (Big Tot's fave), to carrot cakes with creamy centres, and Chocolate cornflake cakes. There are lovely smiley bunny biscuits, which tasted like the softest biscuit ever, and which Little Tot would have happily fought you for! And for those not so keen on sweetness, like Gadget Dad, there are traditional Hot Cross Buns almost bursting with fruit. The best thing about these compared to shop bought eggs is that they are hand made daily- we know as we had the pleasure of meeting our local Greggs baker when he delivered our stash of cakes! You could tell the effort that had gone int everyone, and they tasted divine. So good, you can put them on a plate and fool the family that you baked them yourself! Reasonably priced in store at £2.49 for 4, snap these up before they hop off for good! You can view the whole range at Greggs online. Can't eat sweets? 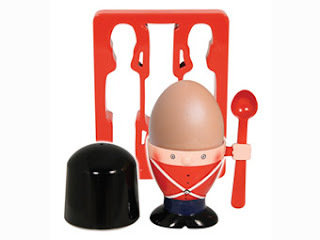 You can still have an egg-cellent time with this quirky Oggz Soldier Egg Cup gift set from Gift Ideas online. Priced at a purse friendly £6.99, the Oggz would make a great gift for a child. It comes complete with a smiley egg cup, with hat, spoon (which attaches to the egg cup for ease of use) and a great Soldier toast cutter too. The smiley face will have the new owner smiling of a morning. Big Tot loved this, and demanded we sang Grand Old Duke of York whilst she ate her breakfast! 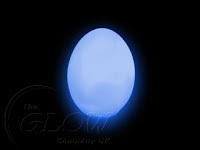 Or for slightly older children, how about a colour changing, glowing egg? Available from the website and made by The Glow Company, these battery operated EGGS (listed as OGGZ on the site!) will sit for hours, softly changing colours, and the colour can be paused if you find one that's right for your Easter Mood. They can be placed anywhere, and used for any occasion too. When switched off they are white. Priced at a ridiculous £29.99 for 3 with a recharger included, they are a relatively cheap novelty alternative which will get people talking! So what do you buy for Teens who are so over Easter bunnies? Well, we asked our Teen Niece, a typical teen i-Pod lover to try out a Mindi portable speaker from Urbanz.co.uk. These quirky, back pack portable speakers are great fun, and made from durable plastic. They stand up easily due to their shape. The best thing is that they finally help with the age old problem of portable music. In our day, we had walkmans, which, just like the modern day i-Pod, MP3 and Music containing mobile equivalent are great for listening to music on your own, but if you want to listen to music outdoors with friends the options are the docking stations, which are quite large and not exactly portable, or the old fashioned one set of headphones between two. 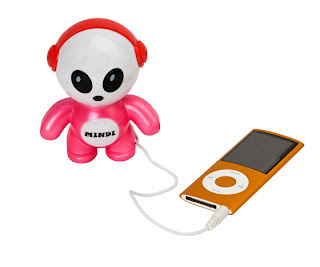 With the Mindi, the i-Pod, Mp3 or mobile phone is simply plugged in via USB, and of it goes- and there's less chance of the wearer turning their i-Pod up ridiculously loud and affecting their hearing longterm. At £17.99, they are more expensive than your classic chocolate Egg, but they will be very popular indeed. Our Teen Niece loved the look of this, classing it cool. High praise indeed from a teenager! So, whether you go for the sweet, the novelty, or something a little longer lasting, there are plenty of options out there to please everyone. I'll definitely be trying out the Greggs range! They look absolutely gorgeous!